Machine Labels - Ready To Apply Graphics. Custom Machine Labels, made to order. We offer ready-to-apply (RTA) graphics for any application. Machine Labels - Any small-format graphic that applies directly to the outer casing of a physical device (or display) without requiring alterations or tools for installation. 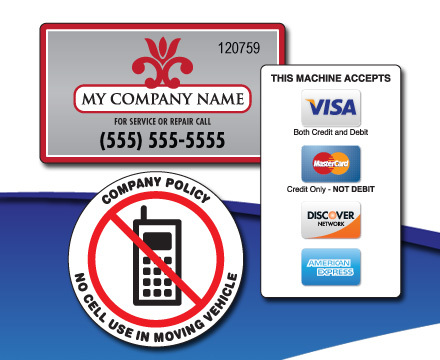 For Service or Repair Machine Identity decals direct consumers to YOUR support system. Now consumers know how to directly contact your company rather than troubling your clients. Machine Identity Label with Sequential Number (left) and Custom Non-Numbered Machine Label (right). With the increasing use of credit/debit cards over currency (cash), advertise your best-rate card payment methods to inform consumers what credit card to use, which will save on your transaction fees. We recommend the standard 3" x 5" ready-to-apply (RTA) decals. Our Accepted Payment Labels are designed to meet your unique needs. 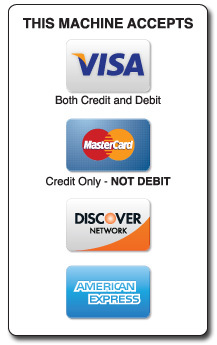 DISCOVER cards, AMEX cards, but NOT MASTERCARD debit cards. Do you have damage claims against your drivers for texting in route? Are you having a problem with other businesses applying decals & advertising on your vending machines? Posting Warning Labels will make your drivers clearly aware of your policies. Advertising Beware decals will help reduce your time removing unwanted stickers from your machines. Post "No Cell Use" decals on delivery dashboards (left), and "Do Not Advertise" labels on machines (right). There are multiple Healthy Vending Programs, such as Fit Pick, developed by the National Automatic Merchandising Association (NAMA). In some cases, these programs offer color-coded tips to add to specific product pushers in machines that carry health-conscious selections in vending machines. While these programs offer standard graphic & mechanical solutions for purchase, we would like to further support the efforts by offering made-to-order graphics as a supplement. Keep in mind we consider each project, at any scale, as its own piece of "art." Contact our Graphics Team by selecting the Contact Us - Graphics Division button to the right. Our online form will only take a few minutes to complete. This will allow us to better address your needs. Machine Graphics can serve more purposes to streamline your business.